For example, simply the chapter on braking helped me in a big way. I used to be the kind of guy who goes downhill like a grandpa, hands on the brakes, forearms throbbing, nearly losing control at everything I hit. The book spells out exactly the things I was experiencing by doing things the wrong way, and then goes on to give incredible pointers on how to kick these bad habits. In this case, the author explains to you that riding the brakes actually gives you less control. I know what you are thinking now, you are thinking, "but I'm not a crazy downhiller who has no fear of losing my life". Point taken, however the tips that are given say that you have better control while coasting. If you think you are going too fast, get on the brakes hard for a brief moment to slow yourself down, and then get right back to coasting. By coasting as you are riding, you free the tires up to glide over anything in your way and you free your upper body up to muscle through those same things if need be. Just this skills tip alone has increased my mountain biking tenfold. But there's more, the book covers things like using "Big Mo" to improve your skills and make you faster. This is another huge chapter for any rider and once you master "Big Mo" it's such a light bulb in your head that you just want to tell others you are riding with. There is A LOT more, more than can be covered here. For less than $20, this is one good investment. 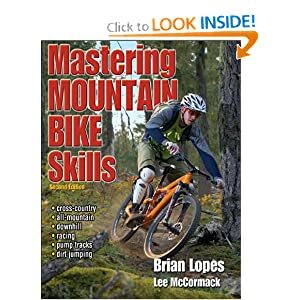 If you are looking for the one thing to increase your mountain biking skills, possibly even more than just getting out there and trying stuff, this is it!